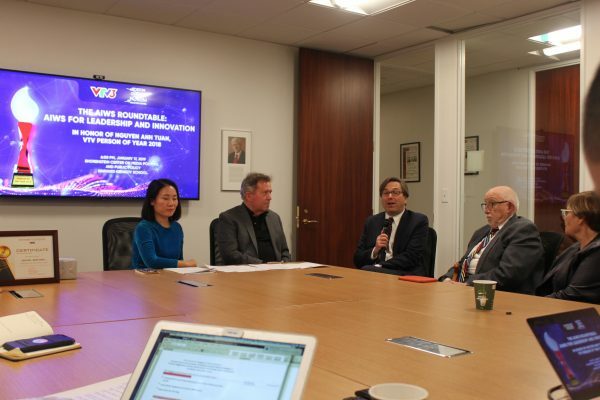 On January 17, 2019 Professor Jason Furman – Chairman of the Council of Economic Advisers and chief economist of former POTUS Obama, and professor at Harvard University’s Kennedy School of Government – gave a talk about AI issues in AIWS Roundtable, which was held by Vietnam National Television (VTV) and Boston Global Forum (BGF). Prof. Furman thinks the most important thing to understand is that technology is not a destiny. “It doesn’t tell us what is going to happen to jobs, it doesn’t tell us what is going to happen to wages, what is going to happen to our economy and our society,” said Furman. “Technology can give us new choices and new opportunities so that sense can make everything better, but only if we are the user,” Furman noted. According to Prof. Furman, there are new types of jobs, there are more demand for all types of jobs and our jobs have changed. Technology will replace certain tasks, but not entire jobs. That is likely what is going to happen in the future. “But the question is: are you going to prepare people for those jobs, give them the skills and the training? …Robots got a lot of quality. They got a lot of people being disappointed and left down. The way to come about that is education, training, having a system that helps place people in jobs. But the most important in all of this is the more innovation we have, the better sets of options and choices we have as long as we are willing to do what we need to take advantage of,” he explained. Furman said one of the advantages that machine have is that some of these problems may actually be solvable on the machine side than the human side, but only we put an effort into it.